There have been some exciting milestones achieved by our Career Tracks initiative. Career Tracks is the new UC Wide job classification system that UCSC is implementing to replace our current non-represented job classification system. 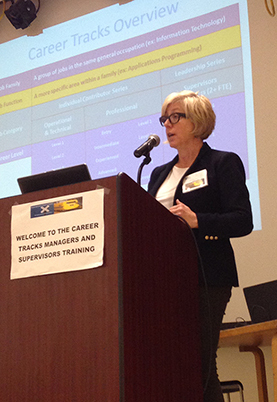 The initial efforts of Karen and the Career Tracks team have yielded great results; Mapping Partners, Managers and Supervisors attended our first round of trainings in person and virtually to get information and become involved. We also received good suggestions about ongoing outreach efforts and getting the information to Academic staff who are managers and supervisors. Career Tracks Website Goes Live - The Career Tracks website was developed and launched to provide the campus with project information, roles & expectations, key dates, news and resources. The site will be continuously updated with important project information throughout the duration of the launch and roll out of Career Tracks at UCSC. Join your colleagues and bring your questions to one of our Career Tracks Town Hall Events. Though effected employees are non-represented, non-academic staff employees, the entire campus is welcome to find out more information. Attendees will receive an overview and learn the key milestones and details of this much anticipated program as it arrives at UC Santa Cruz. Our campus implementation is being managed by Staff Human Resources with support from the UCOP project team headed up by Elvia Ontiveros-Moreno. The project timeline and milestones have been developed with a goal of having all eligible employees converted simultaneously to facilitate calibration and consistent treatment across all organizational units and job families.